At the invitation of the government of the French Republic and the government of Burkina Faso, Vice Premier of the State Council Hu Chunhua will visit these two countries from July 8 to 13. 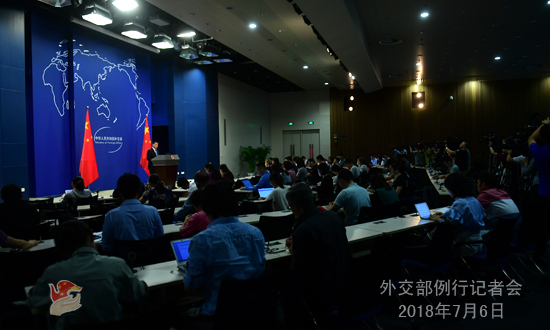 Q: The imposition of an additional 25% tariff on 34 billion dollars worth of Chinese goods by the US administration has officially come into effect today. What is the response of China's Foreign Ministry to it? A: In blatant violation of the WTO rules, this wrong move of the United States will deal a blow to the global trading order, cause fluctuations in the global market and hamper global economic recovery. More transnational corporations, small and medium-sized enterprises and consumers around the world will be hurt and a lot of industries and the general public in the US have come to realize that they will suffer a lot from it. Actually, this string of unilateralist as well as trade and investment protectionist measures recently taken by the US administration has aroused wide concern and condemnation worldwide and incurred countermeasures and retaliatory moves from many countries. The Chinese side is always opposed to unilateralism and trade and investment protectionism. We have been making utmost efforts to make the relevant party view the globalization process in an objective way and deal with the differences and problems arising in the trade relations in a reasonable manner. However, this needs the relevant party to do likewise. Any attempt to pressure others unilaterally is futile and no illusion should be entertained in this regard. When China's legitimate interests are treated unfairly, we are justified in taking necessary countermeasures. 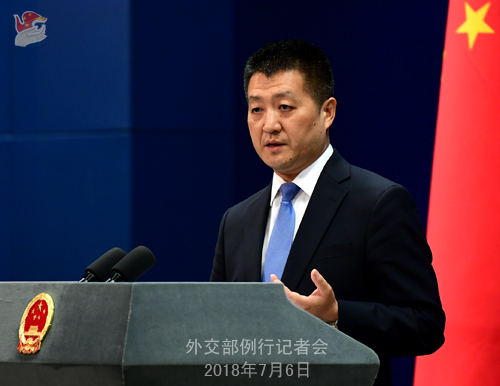 The Spokesperson of China's Commerce Ministry said today that we will inform the WTO of what's going on and we are determined to work with other countries around the globe to uphold free trade and multilateral trading regime. Q: On July 5, two boats with 133 on board capsized near the island of Phuket in Thailand, and most of the passengers are Chinese. Could the Foreign Ministry tell us the exact number of Chinese tourists on board? How serious are these casualties? A: On the afternoon of July 5 local time, two boats carrying 133 tourists capsized off the coast of Koh Hae and Koh Mai Thon in Phuket, Thailand, among whom 127 are Chinese. Up to now, 78 Chinese have been rescued, while 33 still missing and 16 killed (Note: the data has been modified according to the latest updates). Some of the injured Chinese tourists have been sent to the hospitals for emergence treatment. We will keep you posted on the situation as the rescue efforts are still undergoing. The CPC Central Committee and the State Council attach high importance to this accident, and Secretary General Xi Jinping and other leaders of the CPC Central Committee and the State Council have made important instructions. The Foreign Ministry launched the emergency response mechanism without delay. An inter-agency task force, led and set up by the Foreign Ministry, is on its way to Thailand. The Chinese Embassy and consulates in Thailand sent a working team to Phuket this morning to handle the matter. Officials from the Chinese Consulate General in Songkhla went to the hospital to visit the injured that very night, coordinated with the hospitals in their efforts to treat the patients and called on Chinese teachers and and overseas Chinese students to volunteer their assistance in hospitals. The Governor of Phuket Province has also arrived at the scene to oversee the rescue efforts and the Thai navy, maritime police and tourist police have sent many boats and helicopters to assist in the non-stop search and rescue. Rescue efforts have been made on the land, at sea and in the air. We thank Thailand for the search and rescue efforts and the treatment for the injured ones. We hope it will continue to search for the missing ones, treat the injured, comfort the families and properly deal with the follow-up matters. The Chinese government and diplomatic missions in Thailand will continue to make full efforts to assist the Chinese citizens and their families involved. Once again, the hotline of the Chinese Foreign Ministry's Global Emergency Call Center for Consular Protection is 12308, and the emergency hotline of the Chinese Embassy in Thailand is 0066-642351752 and 0066-820367651. Also I would like to stress here that recently, there were a succession of traffic accidents involving Chinese tourists overseas. The summer holiday month of July marks a peak season for outbound trips. We again remind Chinese citizens traveling abroad to raise safety awareness, pay close attention to the safety alerts issued by local governments and relevant departments, cautiously arrange for their agenda and put safety first. Q: Firstly, has China actually implemented customs tariff yet? Secondly, when was the last time that President Xi Jinping and President Trump spoke, whether about trade war or anything else? A: With regard to your first question, the Customs Tariff Commission of the State Council, the Commerce Ministry and the General Administration of Customs have issued the information that, the instant that the US' unilateral and unfair imposition of additional tariffs on China came into effect, China's tariff increase on some of American exports also took effect immediately. Regarding your second question, China and the US have maintained communication on issues of mutual concern. As to the specific economic and trade issues you mentioned, China's position is quite clear-cut and consistent and the US officials at various levels are quite clear about it. Q: The UN Secretary General has appointed the new head for the UN Military Observer Group in India and Pakistan (UNMOGIP). What is China's comment? A: We have noted relevant reports. 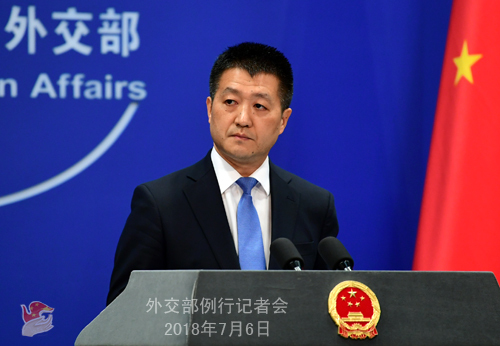 As a neighbor and friend of both Pakistan and India, China hopes that Pakistan and India can continue with dialogue and consultation, deal with relevant issues in a cool-headed and proper manner and jointly stay committed to the peace and stability of the South Asia region. Q: The 8th Meeting of the BRICS Trade Ministers was held in Johannesburg, South Africa yesterday. We learned that mainly China's economic officials attended the meeting. What are the Foreign Ministry's comments on this meeting? A: On July 5, the 8th Meeting of the BRICS Trade Ministers was held in Johannesburg, South Africa, which mainly aimed to lay the groundwork for the Johannesburg Summit to be held from July 25 to 27 in the economic and trade fields. As to the specifics of the meeting, the Chinese side has issued the relevant information and you may refer to it. This meeting was held against a special background because the current international economic and trade situations are complex and grave with rising unilateralism and trade and investment protectionism. You may have noted that the meeting issued the statement on the BRICS countries' supporting multilateral trading regime and opposing unilateralism and protectionism. The statement said that the BRICS countries are committed to resolutely upholding the rules-based, non-discriminatory, transparent, open and inclusive multilateral trading regime with the WTO at its core and firmly oppose unilateralism and protectionism. They are gravely concerned about the unilateral measures which do not conform to the WTO rules and put the multilateral trading regime in crisis. The statement called upon the WTO members to abide by the WTO rules, honor their commitments on the multilateral trading regime, jointly strengthen the WTO and go all out to address the grave challenges facing the multilateral trading regime. I believe this not only reflects the viewpoints of the BRICS countries but also represents the aspirations of the international community. As a Chinese saying goes, "A just cause enjoys abundant support, while an unjust cause finds little". I believe that any move that goes against the economic law, the international consensus and the trend of the times will lead to nowhere and that the people who take such moves will have to pay the price. Q: Firstly, has China's imposition of additional tariffs on some of the American exports come into effect? When will it be implemented? Secondly, in the past 24 hours, have China and the US conducted consultations and dialogue on this issue? A: Just now I have taken similar questions. With regard to your first question, the Customs Tariff Commission of the State Council, the Commerce Ministry and the General Administration of Customs have issued the information. Once the US unilateral and unfair imposition of additional tariffs on China came into effect, China's tariff increase on some of American exports also took effect immediately. Regarding your second question, since the US provoked the trade disputes, China and the US have maintained communications on this issue. China has been making utmost efforts to help the relevant party view the differences and problems arising from bilateral trade in an objective way and deal with them in a reasonable manner. This position is clear-cut and consistent. The US side has been quite clear about China's position from the very first day. Q: Zambian President Edgar Lungu recently attended the launching ceremony of the program of "Access to Satellite TV for 10,000 African Villages" at a primary school in Eastern Province, and he was joined by officials from the Chinese Embassy in Zambia. In the China-Africa Forum on Media Cooperation last week, this program was also frequently mentioned by African media. Can you brief us on how this program is going and its role in China-Africa cultural and people-to-people exchanges? A: The program of "Access to Satellite TV for 10,000 African Villages" is part of China's aids to Africa as announced by President Xi Jinping at the Forum on China-Africa Cooperation (FOCAC) Johannesburg Summit in 2015, with a view to enriching the cultural life of local African people and strengthening China-Africa cultural exchanges and emotional bonds between the Chinese and African people. The program was officially launched last August and is now working to provide digital television signals to 10,000 villages in 25 African countries. The program in Zambia you mentioned is part of the whole program in Africa. We are glad that primary school students in Zambia's remote regions can now enjoy watching the 2018 FIFA World Cup thanks to this program! China-Africa cooperation in various fields is developing fast now, and an extensive array of cooperation projects, the "Access to Satellite TV for 10,000 African Villages" program included, have lent strong support to the diversified development of African economy and its self-driven sustainable development. The upcoming FOCAC Beijing Summit this September will make new plans for China-Africa Comprehensive Strategic Cooperative Partnership. We stand ready to work with our African brothers for win-win cooperation and common development and give Chinese and African people greater sense of gain. Q: Could you tell us what value of US goods is affected and how many products are on that list? A: As to the specifics on imposing tariffs you mentioned, I will refer you to competent authorities. Q: Just now you announced that Vice Premier Hu Chunhua will visit Burkina Faso. We all know that it has been just over one month since the resumption of diplomatic ties between China and Burkina Faso. What is the special significance of the Chinese government delegation's visit to Burkina Faso? What are the arrangements for this visit and what are China's expectations? A: On May 26, China and Burkina Faso signed the joint communique on the resumption of diplomatic relations in Beijing, which officially announced that the two countries resumed diplomatic relations at ambassadorial level. Since then, our bilateral ties have been developing in a smooth manner. Exchanges and contacts between various departments have been restarted in a comprehensive way and cooperation across the board has been carried out in an orderly manner. President Roch Marc Christian Kabore of Burkina Faso will attend the Beijing Summit of the Forum on China-Africa Cooperation (FOCAC) in September upon invitation. Vice Premier Hu Chunhua's upcoming visit is the first one by a Chinese government delegation in less than two month since the resumption of diplomatic ties between the two sides. This demonstrates that the two governments highly value bilateral ties. During Vice Premier Hu Chunhua's stay in Burkina Faso, he will meet with President Roch Marc Christian Kabore and hold talks with Prime Minister Paul Kaba Thieba on China-Burkina Faso ties, the FOCAC Beijing Summit and other issues of mutual interest. Vice Premier Hu Chunhua and leaders of Burkina Faso will attend the unveiling ceremony of the Chinese Embassy in Burkina Faso. The facts have proven that the resumption of diplomatic relations between China and Burkina Faso fully serves the fundamental and long-term interests of the two peoples and will open up even brighter prospects for the national development of Burkina Faso and deliver tangible benefits to its people. We are convinced that this visit will play an important role in enhancing political mutual trust, advancing friendly cooperation in various areas, deepening the mutual understanding and friendship between the two peoples and injecting strong impetus into the future growth of China-Burkina Faso relations. Q: Shoko Asahara, the leader of the Aum Shinrikyo, or Aum Supreme Truth cult, and the perpetrator of a sarin gas attack on the Tokyo subway was executed this morning in Tokyo. What is your comment? A: Back then China condemned this heinous incident perpetrated by the members of the evil cult which caused severe civilian casualties. Q: The Chinese Foreign Ministry and Ministry of Commerce once said that the door for talks was open. Will China and the US continue with the talks since the trade war is now on? A: I would like to stress that on China's part, we don't want to see differences over trade being escalated into disputes or frictions, still less a trade war, because a trade war is no good for any country, enterprise or individual. From the very start, China has made enormous efforts with the hope that the relevant party could put in perspective the process of globalization, including issues arising from this process, and reasonably address the differences in trade ties, but this calls for similar efforts from the relevant party. The attempt to bully others in trade relations is doomed to fail. China's position remains consistent and clear-cut. Offcials at all levels within the US administration know this perfectly well from the very beginning.